Saddle Ridge Ranch – Salem Association Vacation Bible School (VBS) Team recently completed plans for the VBS Leadership Conference scheduled for Saturday, April 17th @ Woodbury First Baptist Church. Front row L to R: Michael Pinegar and Jean Ferrell. Seated L to R: Melissa Cripps, Gloria Pinegar, Lisa Fluty, Deborah Shahan, Katherine Pack, and Donna Nichols. Standing L to R: Carter Rogers, Buck Barton, Jenny Sissom, Steve Puckett, Vicky Puckett, Tommy Shahan, Sam Garrison, Connie Odom, Jessica Hurley and Josh Odom. Salem Baptist Association churches will provide training for VBS teachers and leaders on Saturday, April 17, 2010, at Woodbury First Baptist Church. 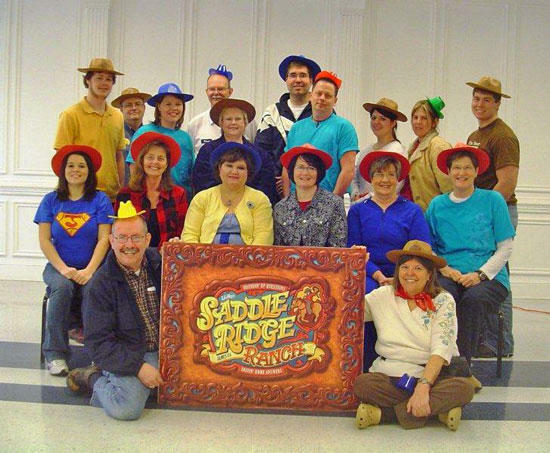 This year’s 2010 VBS theme for participating churches will be “Saddle Ridge Ranch: Roundin’ Up Questions, Drivin’ Home Answers.” Salem Association includes 33 Baptist churches in Cannon, Dekalb and Coffee counties. When 2010 VBS curriculum was being developed, kids were interviewed about things they thought were important. One question focused on what they would like to ask God. Some of their responses were: “Who am I? Does God Care About Me?” What is God’s plan for my life?” During Saddle Ridge Ranch VBS, children and adults will explore God’s Word for these answers. As cowpoke kids and ranch hand leaders study around the campfire together, they will have the opportunity to discover about God and about life. The Salem 2010 VBS Team is anticipated to train approximately 200 church leaders using LifeWay’s Saddle Ridge Ranch materials on April 17 beginning at 9:00 AM. Classes will be provided for Bible study, music, crafts, missions, recreation, decoration/promotion and evangelism. Later this summer, leaders will provide the Big Sky Country ranch experience for children and adults enrolled in VBS.